Greyhound racing on a Sunday night returned to Gawler on the holiday weekend ( for this week only) and attracted an excellent crowd. In the first race on the program, a 400m Maiden event, Shakshukka jumped from box 3 to quickly up the front running, but was then headed by Senni Max (6).Setting a fast pace, Senni Max was able to maintain the lead, going on to win by 1 ½ lengths in a good Maiden winning time of 22.91 secs. Second was Jervois Boy (4) for Tim Richards of Meningie, with Shakshukka running third for Paul Fagan of Calomba. Senni Max is trained at Williamstown by Peter Wilton, and raced by his daughter Mariane, who was disappointed that she had a prior engagement and missed the opportunity to witness the win. A veterinary nurse, Mariane loves greyhounds because of their good nature and ease of handling. Peter has been involved in greyhounds for over twenty years, being introduced through his neighbour, who is well known greyhound vet and breeder Jane McNicholl, also sharing a common interest in horse riding. Peter explained that he has not had many greyhounds over that period, as he keeps his dogs from racing right through their retirement, and then seeks out a replacement. Peter loves to see greyhounds run on his property and at the track, considering them to be the “ultimate racing machine”. “Max” was originally raced in Victoria, and came into Peter’s care when the previous owner sent the dog to SA and then decided to part company with the dog. After a couple of breaks in racing, Max returned to the track in February and ran a second placing at Gawler, with an improved time. Peter considers Max to be a good beginner, and he was concerned that he had drawn a little wide in box 6, but he need not have worried. Max has proven difficult to place in the boxes, and Peter was grateful for the excellent effort today of Jayde Hurley, who achieved that without a hitch. Peter was joined on the track for his photo by his neighbour’s daughter Jade McInerney, who described Max as “adorable’. 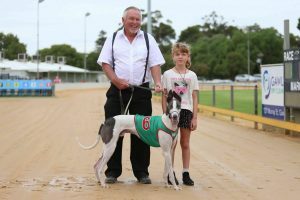 The white and blue dog has had just the 7 starts for a win and three second placings, so he now maybe ready to show his best with his new trainer. Racing is held at Gawler every Friday and Tuesday afternoon, and another Sunday night meeting will be conducted on 31st March, in lieu of Friday 29th.